Enerpac introduces the ZUA Hydraulic Pump Series, which are engineered specically for pre and post stressing, contain fewer moving parts and generate less friction to provide more power and reliability. The ZUA A300 Series are stressing umps with 1.25kw motor that increases the speed of operations to reduce cycle times. It features an ergonomic design to enhance ease of transportation and reduce operator fatigue. The ZUA 700 Bar Electric Pumps uses 1.25kw in energy and stays longer on jobs, runs cooler and are easier to service. 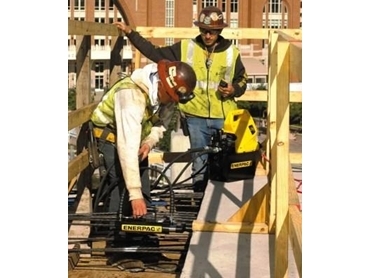 The ZU448REA300 Double-Acting Pumps are rugged workhorses that can be coupled with compact and powerful Enerpac post-tensioning tools for mono strand construction applications. The ZU448REA300 Double-Acting Pump features remote pump control and advance/hold/retract valving. The ZUAT Series Electric Pumps weigh are compact, highly portable and employs a powerful 1.25kW universal motor that provides a higher power-to-weight ratio and low voltage operating characteristics. The motor’s design reduces oil flow turbulence, produces industrial workhorses with few moving parts and less friction. The Enerpac ZUA Hydraulic Pump Series high efficiency and cooler running designs, combined with heavy duty FRP composite shroud, provides resistance to harsh conditions in the sun and the rain.